"I have no idea what it was," Bartlett, now a 46-year-old artist living in Needham, said in a recent interview. "I definitely know I saw something." The "Dover Demon" that Bartlett and two other teenagers reported seeing over a two-day span in April 1977 has since gained worldwide attention, not unlike Bigfoot, the Loch Ness monster, and the Latin American goat-sucker, the chupacabra. Internet pages are devoted to the Dover Demon. You can play a video game featuring the creature, or buy a figurine of it as far away as Japan. "In a lot of ways it's kind of embarrassing to me," said Bartlett. "I definitely saw something. It was definitely weird. I didn't make it up. Sometimes I wish I had." He has made a career as a painter, his work displayed in galleries on both coasts, but a Google search on "Bill Bartlett," he noted, invariably turns up his teenage encounter with the unknown. Once, his wife, Gwen, browsing the horror section of a bookstore, flipped open an encyclopedia of monsters -- and there was an entry about her husband and the Dover Demon. "It's a thing that's been following me for years," Bartlett said. "Not the creature -- the story. Sometimes I dread every Halloween getting calls about it." On April 21, 1977, Bartlett, then 17, was driving along Farm Street at around 10 p.m. when, he said, he saw the creature atop a broken stone wall. Two hours later, according to news accounts from that time, John Baxter, 15, was walking home from his girlfriend's house when he got within 15 feet of the creature along a creek in a heavily wooded area along Miller Hill Road. 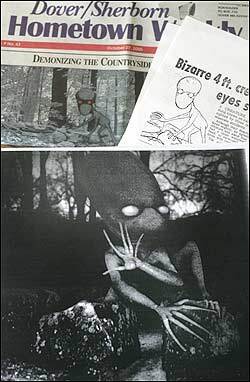 A drawing made by Baxter showed a humanoid figure with large eyes standing by a tree. Bartlett's large-eyed creature crawled with tendril-like fingers across a stone wall. "I, Bill Bartlett, swear on a stack of Bibles that I saw this creature," he wrote on the sketch. The locations of the sightings, plotted on a map, lay in a straight line over 2 1/2 miles. All the sightings were made in the vicinity of water. The following year, he said, he was in a parked car with his girlfriend when he heard a thump on the car. He made out a small figure leaving the scene. He remains unsure who -- or what -- banged the car, he said, though it could have been a youngster playing a prank. Farm Street on a recent evening could have been a modern-day Sleepy Hollow, with woods lining the fieldstone walls, and what little light there was coming from the moon. Since at least the 17th century, the vicinity of the second-oldest road in Dover has been associated with strange occurrences. "In early times this road went around by the picturesque Polka rock [on the farm of George Battelle] which was called for a man by that name, of whom it is remembered, that amid the superstitions of the age he thought he saw his Satanic Majesty as he was riding on horseback by this secluded spot. "The location has long been looked upon as one in which treasures are hid, but why anyone should go so far inland to hide treasures has never been told; however, there has been at times unmistakable evidence of considerable digging in the immediate vicinity of this rock." Loren Coleman of Portland, Maine, a well-known cryptozoologist, or researcher of "hidden animals," from Sasquatch to sea serpents, led the original investigations into the Dover Demon, whose name he coined. Studying Dover's history, Coleman said in a telephone interview, he was struck by the fact that the area in which the Demon was sighted had a tradition of unexplained activity. "In the same area you had three major legends going on," he said, citing the apparition of the devil on horseback, the tales of buried treasure, and then the Dover Demon. "I think it certainly says something. It's almost as if there are certain areas that 'collect' sightings, almost in a magnetic way." Coleman theorized that the large geologic outcropping in the woods off Farm Street that historian Smith called the "Polka stone might actually have been called the Pooka stone, after the fairy folk of Celtic folklore. Mark Sennott of Sherborn, who was buying a bagel and coffee at Isabella's Groceria in Dover Center on a recent Saturday morning, said there was talk at Dover-Sherborn High School in the early 1970s of strange things seen in the woods. In fact, Sennott said, he and his friends might have seen a "demon" themselves at Channing Pond on Springdale Avenue in 1972. "I don't know if we really saw something," he said. "We thought we did. ..... We saw a small figure, deep in the woods, moving at the edge of the pond. We could see it moving in the headlights. We didn't know -- it could have been an animal." Sennott said the group told police, who investigated, but "nothing came of it." When Bartlett saw his creature five years later, he said, he was driving with two friends on Farm Street near Bridge Street on the way to Sherborn about 10 p.m. They hadn't had any beer: "We were probably looking for it," he said, "but we didn't have any that night." Bartlett said the car was traveling maybe 35 to 40 miles per hour when he saw the thing "standing on a wall, its eyes glowing" in the headlights. "It was not a dog or a cat," he said. "It had no tail. It had an egg-shaped head." He said he saw it from about 10 feet away, over the duration it took the car to travel from one utility pole to the next. His two friends did not report seeing the creature. He grew up around animals, and had seen the odd mangy fox, Bartlett said. "This definitely wasn't," he said. "It was some kind of creature," with "long thin fingers" and "more human-like in its form than animal." Its shape reminded him of "kids with distended bellies," he said. "I've always tried to guess what it was. I never had any idea." This was no prank, Bartlett said. "I wasn't trying to be funny. People who know me know I didn't make this up." Coleman, who began an investigation within days of the sightings in 1977 and spotlights the Dover Demon case in the 2001 edition of his book "Mysterious America," believes Bartlett. "We have a credible case, over 25 hours, by individuals who saw something," said Coleman, who interviewed all three teens within a week of the reported sightings and said he was convinced they had not concocted a hoax. "It doesn't really fit any place," Coleman said. "It's extremely unique. It has no real connections to any other inexplicable phenomena." As for the moose theory, only two moose were reported in Massachusetts in 1977 and 1978, both of them in Central Massachusetts, he said. A yearling moose by that time in April would weigh more than 600 pounds and be "bigger than the Volkswagen Bartlett was in," said Coleman. "To have a bipedal moose with long fingers and orange skin and no hair and no nose would be more of a phenomenon than the Dover Demon," he said. So what did those teens see? "It's OK to say we don't know," said Coleman. "I think the Dover Demon's mystery lives on. It's an unknown phenomenon whose fame has stretched worldwide, and I think Dover should be very proud." "That thing has haunted me for 29 years," said Carl Sheridan, a former police chief. "I knew the kids involved. They were good kids ..... pretty reliable kids. "God only knows" what they saw, Sheridan said. "I still don't know. Strange things have happened. The whole thing was unusual." He got calls from all over the world when the case made the news, the former chief said, and he still does, from time to time. "The thing will not die," Sheridan said. "I'm telling you, the thing will not go away." In Town Clerk Barrie Clough's office at Town Hall, municipal reports share shelf space with a file of materials related to the Dover Demon case, including a book titled, "Weird New England," and a newspaper clipping headlined, "Bizarre four-foot creature with orange skin and glowing eyes stalking a town." "Every once in a while people will come in and ask about it," said Clough. "I have no idea if it's true or untrue." Downtown Dover was decorated recently with pumpkins as children arrived for a Halloween fair, and a steady stream of regulars bought coffee and newspapers at Isabella's. Located in the old Dover Pharmacy, now with an Italian deli counter added to the old soda fountain, the grocery remains a town hub. Behind the counter at Isabella's, Scott Bielski, 17, of Dover, a senior at Dover-Sherborn High, said the demon gives his small town a unique claim to fame. "'Home of the Dover Demon' has a nice ring to it," he said with a smile. As far as he knows, the creature had never stopped in to the soda fountain. "Let us know if he wants anything," he said. A customer who gave his name as Jimmy said he has lived in town for four years but has yet to see the demon. "Maybe I will some day," he said. "I'm one of those realists -- if I don't see it, I don't believe it." Customer Ed Tourtellotte of Dover said: "I think it's probably as real as the Easter Bunny, but it's fun." Nearly three decades after seeing something very strange on Farm Street, Bartlett has decidedly mixed feelings about the experience. "It was my 15 minutes of fame, without wanting it," he said. "It was little embarrassing. It still is." He said he hasn't talked much to his two children, 8 and 5 years old, about the creature: "I don't want to scare them." And the professional artist has never drawn another picture of the thing he saw. "I don't have enough memory of it," he said. "I haven't wanted to. I'm a serious fine-arts painter. I don't want people to think I'm some freak. "I don't usually tell anybody. I shouldn't be embarrassed, but you see these people on TV and they're made to look like idiots," he said. "I really do wish that I had made it up. I might have profited from it. It's a great story. "I wish it was seen again so everyone would know it was true." More about the Dover Demon is available at the Strange New England website, strangene.com/monsters/dover.htm, or at Loren Coleman's website, lorencoleman.com.